Most mammalian cells transport glucose through a family of membrane proteins known as glucose transporters (Glut or SLC2A family / solute carrier family 2). Molecular cloning of these glucose transporters has identified a family of closely related genes. Individual members of this family have identical predicted secondary structures with 12 transmembrane domains. 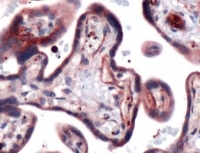 Both N and C-termini are predicted to be cytoplasmic. There is a large extracellular domain between TM1-TM2 and a cytoplasmic domain between TM6-TM7. Most differences in sequence homology exist within the four hydrophilic domains that may play a role in tissue-specific targeting. Glut isoforms differ in their tissue expression, substrate specificity and kinetic characteristics. GLUT1 mediates glucose transport into red cells, and throughout the blood brain barrier. It is ubiquitously expressed and transports glucose in most cells. 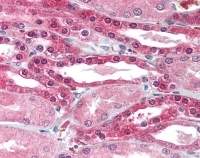 GLUT2 provides glucose to the liver and pancreatic cells. GLUT3 is the main transporter in neurons. GLUT4 is primarily expressed in muscle and adipose tissue and regulated by insulin. GLUT5 transports fructose in intestine and testis. GLUT6 name was previously assigned to a pseudoegene. Now Glut-9 has been renamed as Glut-6 (human 507 aa; ~45% identity with Glut-8). It is highly expressed in brain, spleen, and leukocytes. GLUT7, expressed in liver and other gluconeogenic tissues, mediates glucose flux across endoplasmic reticulum membrane. Most recently, GLUT8 (mouse/rat/human 477 aa, ~30% identity with Glut-1) has been cloned and characterized. High levels are found in adult testis and placenta. Human GLUT9 (540 aa; chromosome 4p15.3-p16) is approx 45% identical with Glut-5, and 38% with Glut-1. It is expressed in kidney, followed by liver. Glut-9 is also detected in placenta, lung, blood leukocytes, heart, and skeletal muscle. Human GLUT10 (541 aa, chromosome 20q13.1; ~30-35% homology with Glut-3 and Glut-8) has been identified as a candidate gene for NIDDM susceptibility. It is widely expressed with highest levels in liver and pancreas. 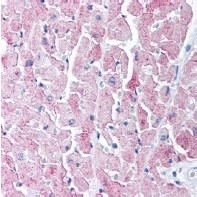 GLUT11 (496 aa, chromosome 22q11.2; ~41% identity with Glut-5) is expressed in heart and skeletal muscle. Recently, a few novel members of Glut family have been identified. GLUT12 (human 617 aa; 29% identity with Glut-4 and 40% with Glut-10). It is expressed in skeletal muscle, adipose tissue, and small intestine. GLUT13 or H+ myo-inositol transporter (HMIT, rat 618 aa; human 629 aa; ~36% identity with Glut-8). It is predominantly expressed in brain. OriGene Technologies offers a panel of antibodies to Glut-1 to Glut-13 which were produced using antigenic sequences unique to each protein. These antibodies do not crossreact with each other and can be used to study specific Glut in mouse, rat, and human tissues. Fig. 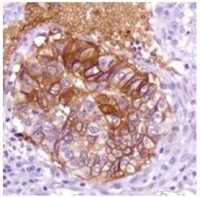 1: AP07454PU-NGLUT10 antibody staining of Formalin-Fixed Paraffin-Embedded Human Kidney. Fig. 2: BP508 GLUT4 antibody staining of Paraffin Embedded Human Heart, demonstrating labelling of cardiac myocytes.